Towards the end of every month I'm going to post an image I really love and want to post to you. The image could be anything from one I've found or my own, it might be a quote or it might just be something pretty, it could have a meaning to everyone or just a meaning to me but no matter where it's from or what it shows I'll be posting it on here and writing something about the image. The purpose of this? I'm not sure. I'd like to post images that at least one person could relate to or an image someone can look and read about then say "that helped me". This is the first image, January's. The term with this picture is "never forget your past" so of course it relates to remembering your past, no matter how you've changed, where you are or what you do. 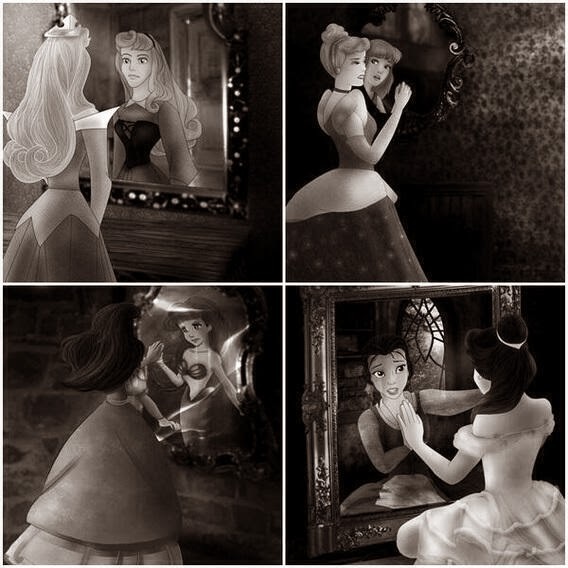 Each of these Disney princesses were once worse off but they were still beautiful with very different lifes. You'll never be too far from the person you once were. I don't want to bring people down with this if you are worse off or if you're regretting your past, you should be happy with who you are and if you want to be the old you then do what feels right. Never feel afraid, be who you want to be.